Former Captain of Sri Lanka naval ship "Sagarawardene," Captain Ajith Boyagoda, brought relief supplies on behalf of the President of Ceylinco Corporation Dr.Lalith Kotalawela to Kilinochchi Wednesday, sources in Kilinochchi said. 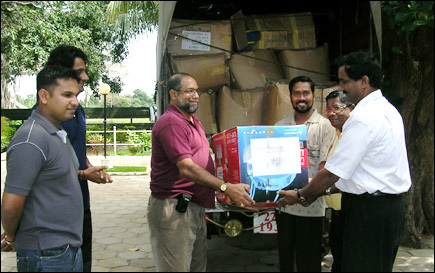 Deputy Leader of LTTE Political Wing, S. Thangan, received the supplies from Boyagoda, according to sources. Former Commander Boyagoda was as a prisoner of war detained by the Liberation Tigers for 8 years since 1994. He was released on 28 September 2002. President of the group Parents of missing soldiers, E.N.Nanayakkara, accompanied Former Capt.Boyagoda during the Kilinochchi visit. Although the party brought with them 5 tractors, Sri Lanka security forces did not provide immediate clearance and the vehicles have been left behind in Vavuniya, sources added. Ceylinco Consolidated has one of the largest privately-owned real estate stockholdings in the country. It includes over 110 subsidiaries and associate companies, covering diverse sectors such as banking, insurance and financial services, real estate, diamonds, jewellery, tourism and IT.